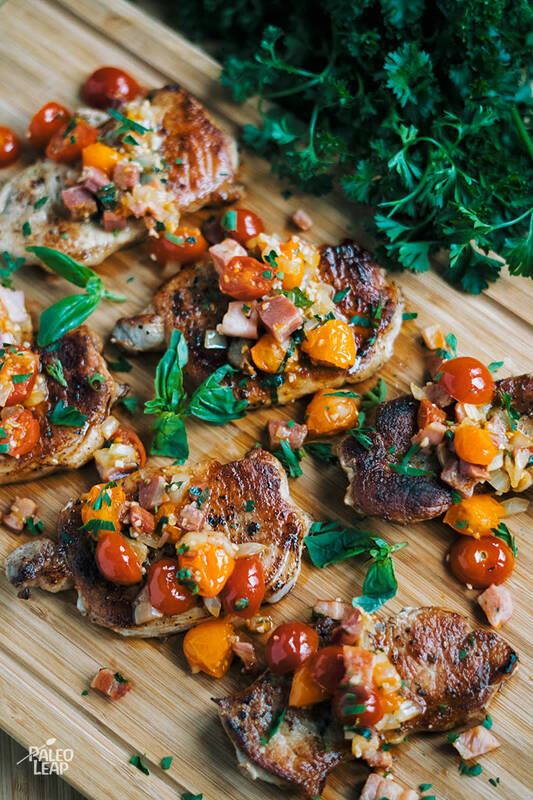 A tomato and pancetta salad sitting pretty atop expertly fried pork chops makes for a very friendly dinner indeed, whether you are dining alone or catering to a party of ten. Pancetta is a cured meat, made from unsmoked pork belly and you’ll either find it thinly sliced or cubed. It is most certainly not bacon, though you can use it as such in cooking – to form the base of a soup or risotto, or you can sauté it with garlic and onions and add a simple fried egg. You can line muffin cups with thin-sliced pancetta, but we are getting carried away with ourselves and dreaming up recipes that we have not even created yet! Just read the package to find out what you are getting. Is it only meat and salt, perhaps some spices too? Or is there added sweetener and preservatives? Bottom line, choose the best you can find and you cannot go wrong. If you ever find yourself with too much pancetta at once, this is a really wonderful problem to have(! ), go ahead and make a tray of baked eggs with pancetta and mushrooms for breakfast. You will be happy and content, if you happen to have guests, then they will be well fed and think of you as a surprisingly good cook – and you can go about your day filled with plenty of energy, enough to conquer the world, or at least the laundry. Cook the pancetta until nicely browned, 3 to 4 minutes, add the onion and garlic, continue cooking 2 to 3 minutes. Add the tomatoes, basil, dried oregano, and cook 2 minutes longer. Drizzle the balsamic vinegar, season to taste, give everything one last stir and set aside. Season the pork chops on both sides to taste. Heat cooking fat over medium-high heat and cook the pork chops 2 to 3 minutes per side, or until no longer pink in the center. Let the pork chops rest about 2 minutes, and serve topped with the tomato-pancetta mixture and more basil.